This week’s SEO Thursdays post for 7 January 2016 is about SEO keywords for small businesses, bloggers, and soloprenuers. I updated this post on 4 July 2017. We are going to discuss what SEO keywords are, why you should care, and how you find and use them. I give two examples. The first is for a blog post. The second uses Instagram. The same principals will apply for most social media applications and website pages. Keywords are the method by which you find the information object you are seeking online. They are how someone finds your “information objects” (i.e., the digital “stuff” on your website). The “information object” could be your blog post, Instagram post, Pinterest pin, or Etsy product. Marketing is one approach to tags, but it is really about cataloging your information so online users can find it. This is why you should care about what words you use when you put something online. It helps people find what you post. Good tags help you find what you are looking for, too, when you have to do an internal search or look online for something or some information. In today’s post, I’m going to speak more generally about SEO keywords. I will not aim specifically at Google AdWords or search on Etsy, Facebook, Instagram, or other closed systems. I will address those in a later post. What is a SEO Keyword? Short version: the theme of your post, whether it is text, an image, a video or a product description. The theme allows machines and people to figure out what your post or image is about, and find it easily. Here’s one definition from Google. an informative word used in an information retrieval system to indicate the content of a document. a significant word mentioned in an index. It sounds, pretty simple, huh? The problem comes if you use a SEO keyword that too many other people use, because then your post will get lost in all the noise. If you use something too rare, fewer people will find you because they will not think to search using that term or phrase. That is why you want to try to find a nice balance. You want to use tags that fall at both ends of that spectrum, and then aim for a few that fall somewhere in between. Where Do I Look to Find SEO Keywords? You may find them in your thesaurus or dictionary. Really. It’s that simple. You don’t need to slog through Google Adwords just yet. Start simple, and then move up to the more detailed software programs available. Think of an initial word or phrase that describes your blog post, image, or product. Then go to a thesaurus and look up related words. 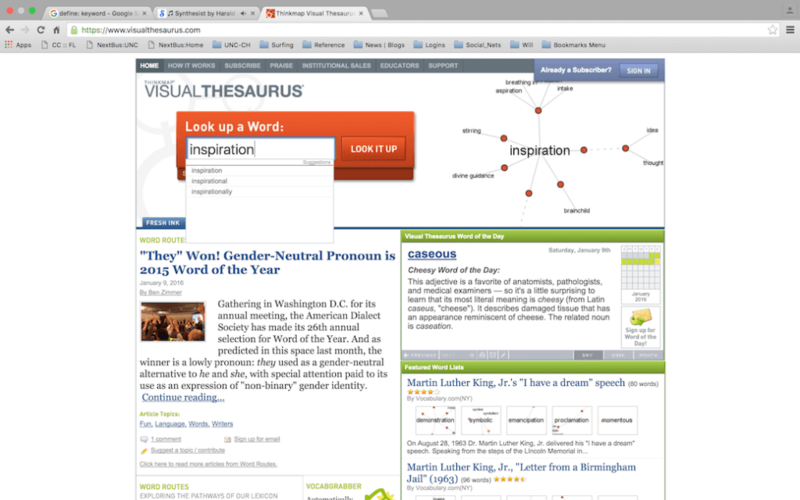 One of my favorites is Visual Thesaurus. I used to post inspirational and motivational blog posts on Mondays. Therefore, today’s example will use the word “inspiration“. 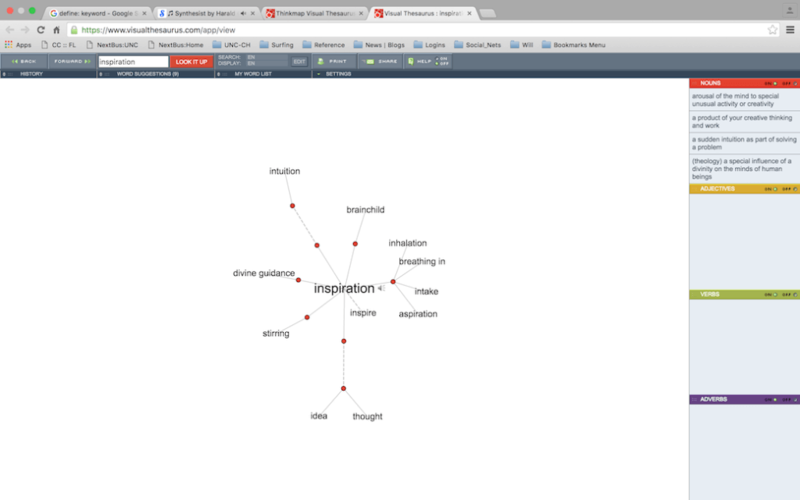 First, go to Visual Thesaurus and type in your tag. Look at what else appears in the drop down list. These are related words. Next, click on the word you would like to learn more about. As you can see in the above example, related words and phrases are provided. You can decide to use your original tag, change to a different word or phrase, or incorporate these related words and phrases into your copy. A similar smartphone app is called HashMe. You type a keyword into the field, and it provides 30 related keywords and/or emojis. The app is designed for Instagram, but you can also use it for website pages, blog posts, and product or service descriptions. On a website, You can use it to integrate in similar words to your post or page to provide a better idea to search engines about the topic of the page or post. The app can also find words based on the image. Below is an image of me with my brand new Robert August custom surfboard from October 2014. How well do you think the app described the image with hashtags? Below is the list of keywords HashMe generated based on the image. One caveat: the words do not take into account the volume of the keywords they pick. Therefore the app does provide words that are so high volume that your post or page or Instagram post may bet lost in the noise. Be very careful about which keywords you decide to copy and paste. Alternately, the app often provides words that are so low volume that no one will search on the term. Therefore, while the word may be accurate, there is no point to using it if no one actually searches with it. My advice is to pick a few of the words and phrases, and check them on Google Trends, if you are using it for a website. If you are using it for a social media platform like Instagram, then search on Instagram to determine the volume of keywords. Instagram veterans with thousands of followers have advised me to use keywords that have a volume greater than 10,000 but less than 1 million. I talk about this further in the section below, “Keywords and Instagram”. If you want to see a list of curated keywords by volume, please see my 375 Instagram hashtags post. Another way to find words or phrases related to your initial word is to search on Google or Bing, and then scroll to the bottom. First, I will step you through a Google search for terms and phrases. Next, we will use the Bing search engine. And last, we will use a nice little search engine called DuckDuckGo. 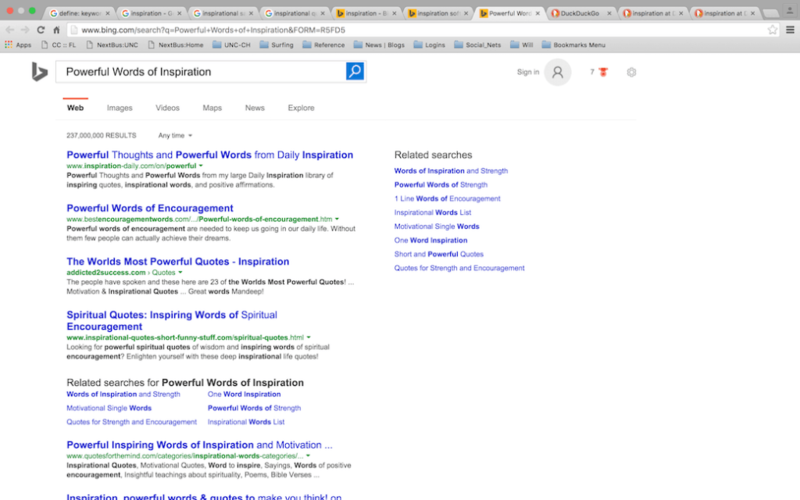 Again, I’ll use the keyword “inspiration”. 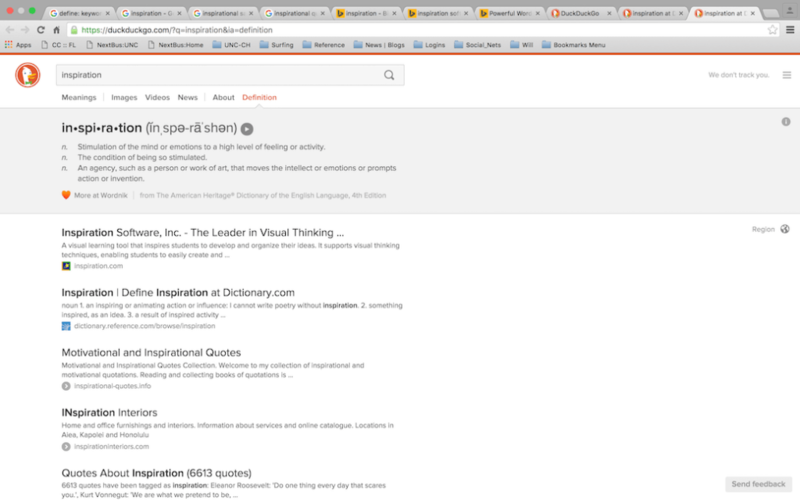 Below, you’ll see how the Google search engine auto suggests related words or phrases. Pick “inspiration” and let the results display. One item to pay attention to in any results returned by a search engine is the number just under the drop down list from the search box. Notice the number above — 723,000,000. You will want to notice how many results could be returned by the search engine. If there are too many, you may want to use a tag that does not have so many results. This is because it makes it harder to rank if a keyword is too commonly used. Next, scroll down to the bottom of a page, where you can find a list of related phrases. This tells you what tags and phrases people are searching for that are related to your SEO keyword. These are the words and phrases you may wish to incorporate into your copy. To repeat: this is the important part, because this is where you can see what people are searching on, and HOW they are searching, for terms related to yours. Next, pick one of the related phrases, and go explore that one. In this instance, I picked “inspirational quotes”. As you can see, this also produces a list of related search phrases, with more at the bottom of the page (not displayed). 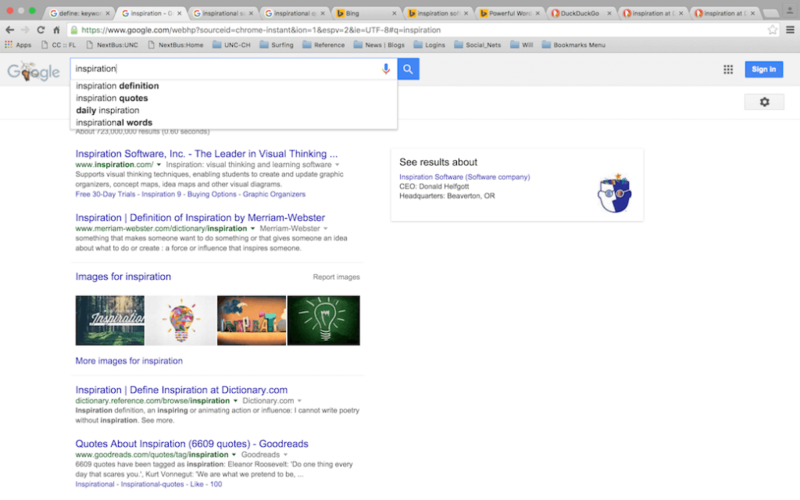 Do scroll down to the bottom of the Google search results page to see related keyword phrases. Poking around like this gives you the opportunity to explore a bit more before you write your final copy. 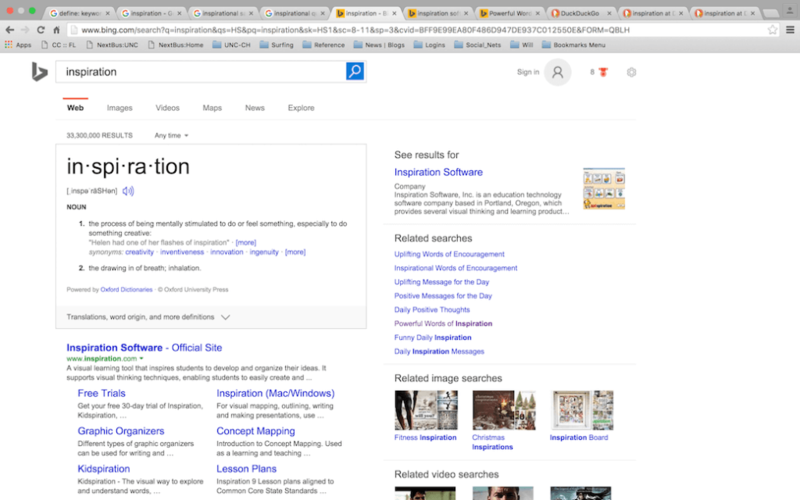 Now, we’ll step through the same ideas as above, but we’ll use the Bing search engine. First, let’s type in the term and see what the Bing search engine suggests. Again, the search engine makes suggestions as to related phrases. 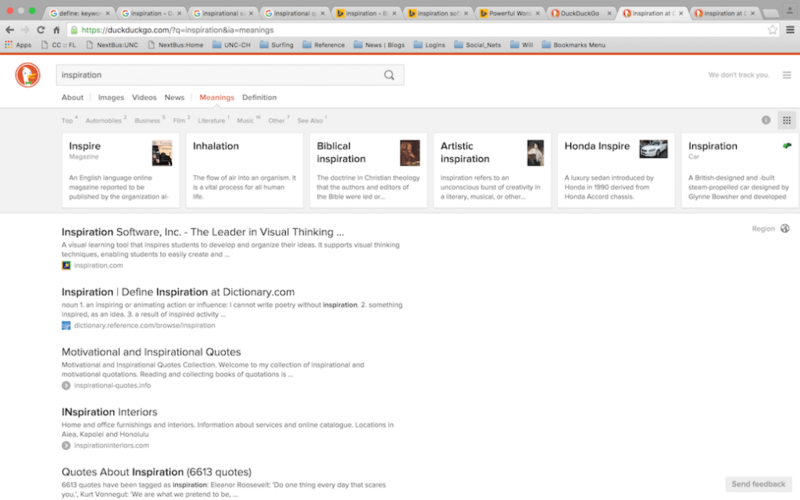 We will chose “inspiration”, and examine the related searches. Bing puts these on the right side of the results, not at the bottom. 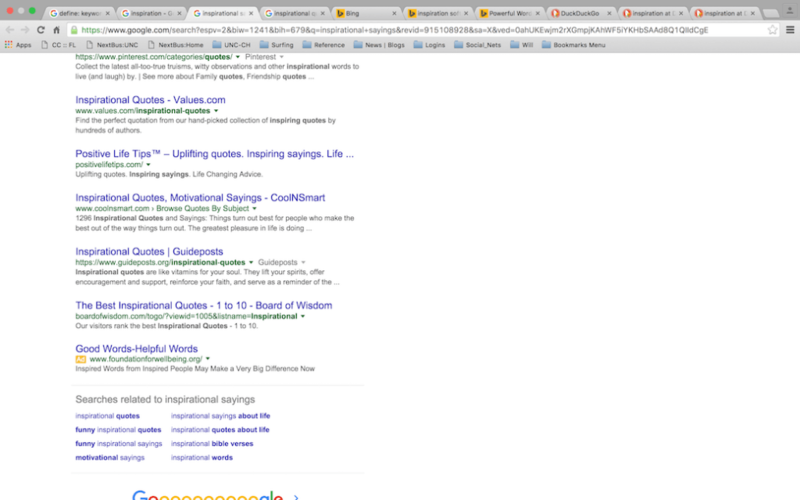 This time, I clicked on the word “powerful words of inspiration” and reviewed those search results. Again, like with Google, these results give you an idea of the top searches related to your term. It shows you how users are searching. You should incorporate this knowledge into your copy, including the alt text of images you use in your blog posts. 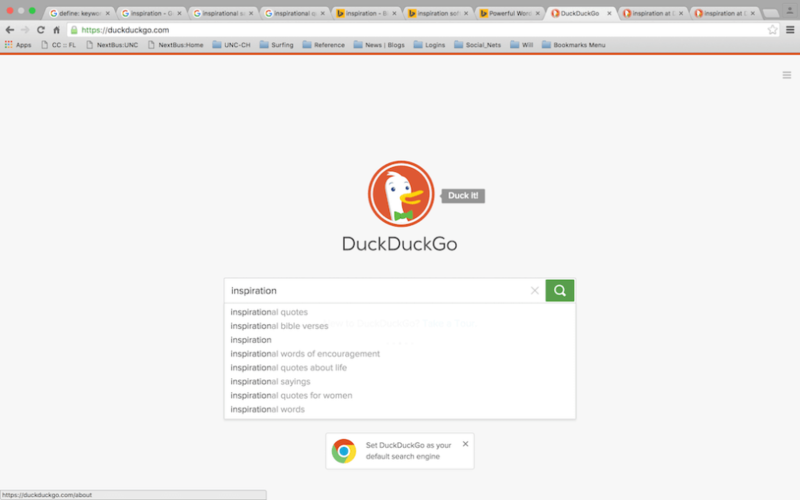 Last, we’ll go through the same steps with DuckDuckGo that we used with Bing and Google. First, we’ll enter the term to see what the search engine suggests as alternate words or phrases. 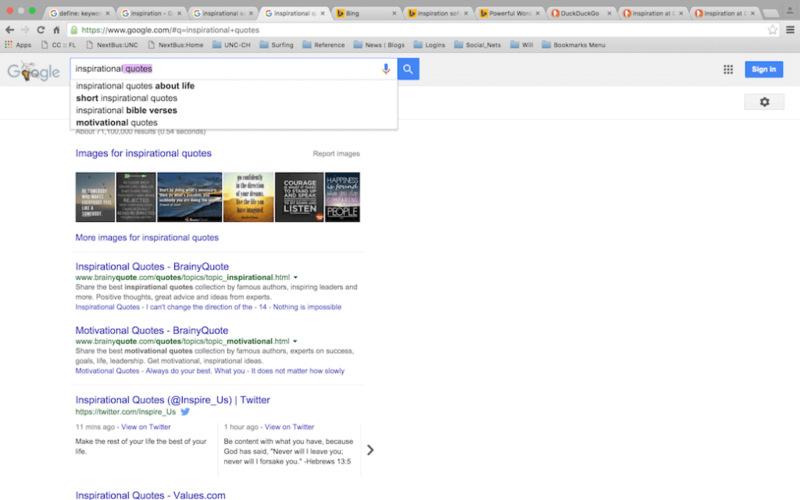 Next, we’ll examine the search results for related terms and phrases. In this case, we’ll review alternate meanings. Then, we’ll review the definitions of the SEO keyword and related phrases. As you can see, DuckDuckGo provides similar results when you search on a tag, but it provides slightly different information than Google and Bing. I recommend using different search engines, as you may find additional words and phrases that you had not yet considered. 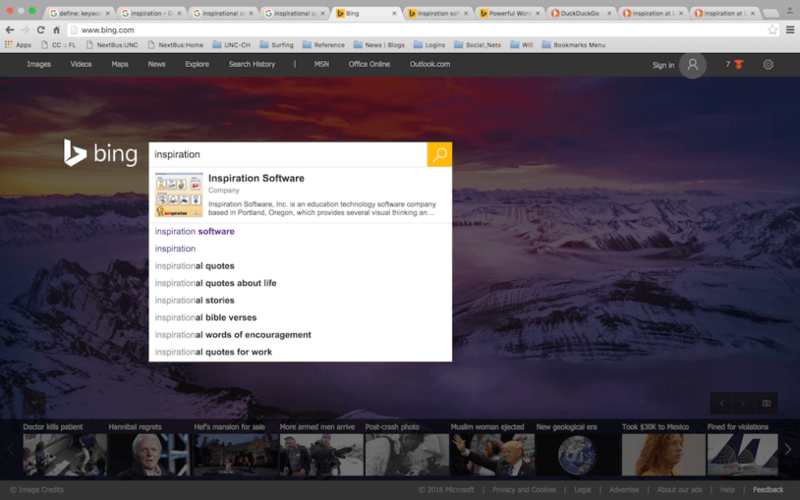 This will make it easier for people to find your posts, images, and/or products. Next, I’ll show you some Instagram examples. This is for a sunset in North Carolina, and I also use the word “inspiration”. First, I look up my initial keyword. I look at the words that Instagram suggests. Is my keyword being used? If so, how much? How little? Be sure to look at the numbers to the right to determine usage. Should I continue to use “inspiration” or should I use “inspirational quotes” instead? Should I go with “inspirational”? Or, shall I use all three? The answer to that depends on whether or not you mind getting “lost” in a huge volume of posts. Of the above choices, I would use #inspirationaquotes, as it is under 1M and you have a greater chance of being found than you would if you used the higher volume hashtags. 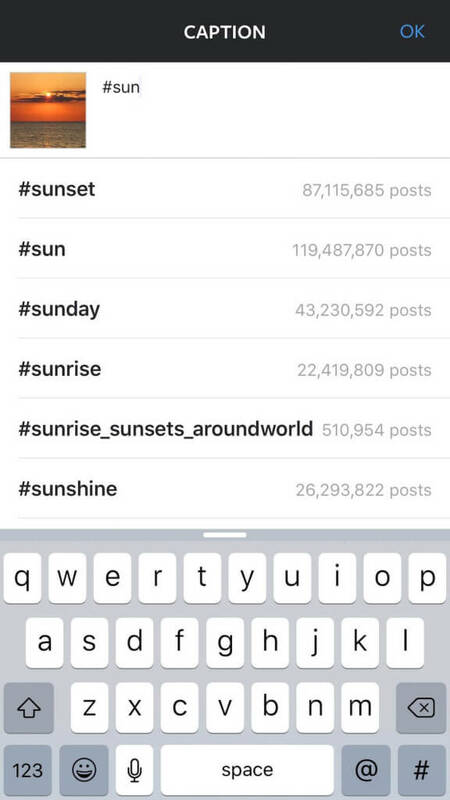 As to how many hashtags to use in a post, Latergramme recommends using no more than eleven hashtags with Instagram. If you use any more than eleven, you may find you may get knocked down in the results algorithm or look desperate to other users. You may use up to 30 hashtags per Instagram post. Here are some other examples of terms I researched for this photo. Next, I’ll show you “sun” and “sunset”. 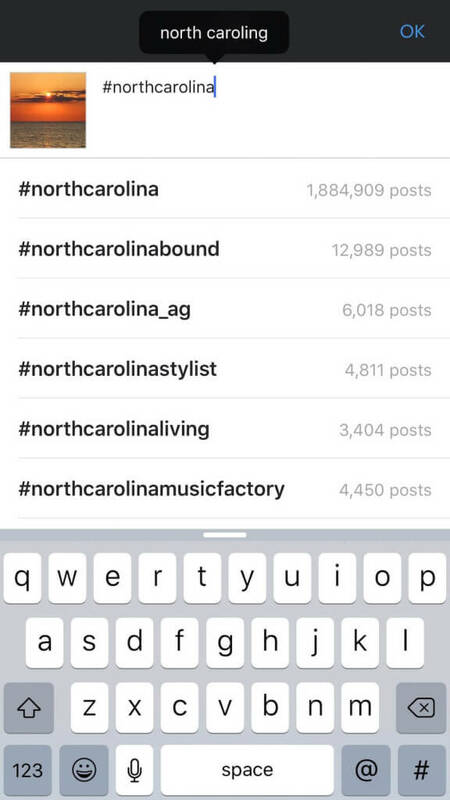 Again, look at the alternate suggested hashtags, and how often this word has been used. Should I used this, or not? Perhaps I should use #sunset_pics, #sunrise_sunsets_aroundworld, #sunsetcliffs, and #sunset_stream? What would you do, if you were posting this image? Which hashtag would you use? Next, I tried a related word to inspiration, which is “quotes”. Again, this word has a lot of usage. Perhaps #quotestagram, #quotestags, and #pinquotes would be better to use than #quotes alone. Yes, I made these choices because of the high volume of the other hashtag choices. Last, but not least, I searched on the location of the image, because I took the photo in the U.S. State of North Carolina. Here, you can see that #northcarolina is used a bit more than I would like, but the other suggested terms are used too little. In this case, the best choice would be to tag the location as “North Carolina” or the town + North Carolina. I would find another hashtag to use instead of #northcarolina. Now, let’s say you are a writer, and you want to write a post about something that inspires you. What is the theme of the topic on which you are writing? What words can you find in a thesaurus that are similar to this word? How are people searching for this word using Google, Bing, and/or Duck Duck Go? // Tip: If you are aiming at a certain market on Pinterest, Etsy, Facebook, or any other closed system that has an internal search engine, then play and poke around on those. // What results show when you begin to type in the word? What results do you get? Do you need to adjust your keyword to something more relevant for your post, image, or product? How can you use the phrases people actually search on in your blog post? Another tip is to use a site like Answer the Public. You can type in a keyword and see what questions people are asking online about the keyword. This will give you blog topics and your post title! You can also save the questions as a CSV file that you can reference later for topics. Good organic SEO is a lot like eating nutritiously. If you take a lot of the small steps, and do the hard work, you will see some results. You may not be certain if your efforts are making a difference. However, if you do not do it, then you will absolutely see a difference in the lack of results and rankings for your site, posts, images, and/or products. Next week, I’ll show you how to use these in a blog post, in order to build up an entire discussion around a particular word. If you have any questions, please ask them in the comments below, or send me a question via the online contact form. I discussed a new topic each week, or re-visited an old one when there was interest from my followers. I’m @impactzoneco on Periscope. I am not running weekly videos currently. I will update this post when I do. Currently, as of July 2017, I am posting SEO tips on my Instagram account. Please follow me on @impactzoneco, and DM with any questions or requests to cover a specific topic. If you would like to get found online, then work with me on your small business SEO keywords.